The start of a new year is the perfect time for a fresh start and new beginnings. Whether you’re starting a new fitness routine, trying to save more money or simply freshening up your appearance— It’s almost like some sort of switch gets flipped on January, 2nd. For a lot of us that means getting a new hair color! Like any major change, this might mean a bit of a learning curve on how to care for your hair, especially when it comes to a new hair color. Even more so when that new hair color is blonde, silver or gray. Whether you just deepened your natural hair color, added a few highlights or went platinum blonde, your “New You” hair is going to need some extra TLC. Lucky for you, taking care of your hair color is easy when you have the right hair care products and the right routine. These simple hair care tips will help you keep your color looking fresh and fabulous as long as possible. First and foremost, make sure your hair care products are sulfate-free! Really this goes for anyone trying to achieve gorgeous hair, but especially those of us with color-treated hair. Hair color and sulfates simply do not mix. Here’s why: The molecules in sulfates attract both oil and water, which seems like a good hair care idea in theory. The idea that sulfates lift away grease and grime, dissolving them so they can be easily rinsed away sounds great, right? Not so much because sulfates in hair care actually cause more problems than they solve. Washing away natural antimicrobial peptides and proteins, lifting hair cuticles, creating an anionic charge, causing scalp irritation, and making hair take longer to dry are just a sample. In doing all this, sulfates disrupt your hair’s biome. Which causes stress on your follicles, weakens hair strands, and causes many hair care pet peeves including dandruff, frizzy hair, split ends, breakage, problems growing hair… and ruining hair color. If you’re blonde or have color-treated hair, hair care products with sulfates can also strip your hair color and cause brassiness. Your absolute first line of defense for your new hair color should be making the switch to sulfate-free hair care. ‘Nough said. If you haven’t heard of the “No Poo” movement, you just may be in the minority when it comes to hair care. In response to hair damage from all those sulfate-laden shampoos, many hair enthusiasts are calling for dropping shampoo altogether. And it makes perfect sense for natural hair that hasn’t been dyed. In fact, various natural hair tonics and herbal remedies have been used throughout history for shiny more manageable hair, but up until the 1970s most people didn’t wash their hair every day. Aggressive hair care marketing campaigns in the 1960s and 70s soon changed the public outlook. By the end of the 1970s consumers were convinced that hair care products, especially shampoo, should be used every day for “healthier” hair. You can probably already see how this snowballed into a relentless cycle that still affects us today. In an effort to get better hair, consumers faithfully shampoo daily, but sulfates (and other harsh chemicals) strip away the natural oils your hair needs to stay strong, shiny and beautiful. Ditching the ‘poo in favor of alternative cleansing like rinsing with baking soda and apple cider vinegar (ACV) is one way to break the cycle— unless you have bleached blonde or other color-treated hair! While ACV and baking soda can work wonders on natural virgin hair, color-treated hair is a whole other story. Using ACV and baking soda can easily strip and dull your new hair color. You can also break the sulfate-cycle by choosing gentler, more natural sulfate-free shampoos and simply shampooing less often. Most hair stylists recommend shampooing hair no more than once every three to four days. It’s kind of a no-brainer, but we’ll just say it: shampooing less is going to mean less washing away hair color. Plus, once you get in a good rhythm of shampooing less often, you’ll start to notice less of a need to shampoo. When you’re locked in a daily shampoo cycle, your scalp goes into overdrive trying to produce more of the natural oils needed to protect hair and scalp. Once you stop shampooing every day your scalp has a chance to revert to more natural oil production. While all color-treated hair needs special consideration when choosing hair care like shampoo, blonde, silver and gray hair colors are even more temperamental. Blonde shades are so tricky, entire hair care lines have been created JUST for properly caring for blonde hair. Even using the most gentle, sulfate-free, all-natural shampoo will not prevent blonde hair color from going brassy between salon visits. Purple shampoo for blondes is the only way to keep your blonde, silver or gray hair looking salon-fresh. Bonus tip: Blonde hair care with purple pigment also keeps purple and blue hair color looking vibrant! After sulfates, heat is the next big destroyer of hair color. Like most things, hair strands are broken down and degraded by extreme heat and exposure to heat over time. One solution is to use hot styling tools less often. Try braiding your hair while damp for crimpy waves, or other wet-set methods like pin curls and hair curlers. Loose beachy waves can also be achieved with various wet set methods and even sea salt spray. When you do use hot tools for styling, it’s important to protect your hair color with the right hair care products. Leave in conditioners and thermal shield sprays are must-haves for days you just can’t skip the curling iron and blow dryer. Conditioning is so important after any new hair color. Even henna and herbal dyes can dry out hair, but any time your hair color involves bleach, there is definitely going to be some damage. The good news is the right conditioning hair care products can help your hair bounce back from bleaching AND protect your new hair color. Of course for blonde, silver and gray hair, following your purple shampoo with purple conditioner is obvious. But, it’s important to make sure you’re choosing purple hair care with nourishing ingredients that will help hydrate, strengthen and seal your hair strands. Always look for conditioning hair care with natural ingredients like coconut oil, palm oil, jojoba oil, avocado oil and argan oil. These are all beneficial for freshly dyed hair color because they’re natural vegetable oils packed with fatty acids your hair needs to look and feel it’s best. In addition to choosing a nourishing conditioner, doing a deep conditioning hair mask once in a while can also help give your hair color a little extra protection. Depending on how dry your hair feels a hair mask can be done once a week or every other week. 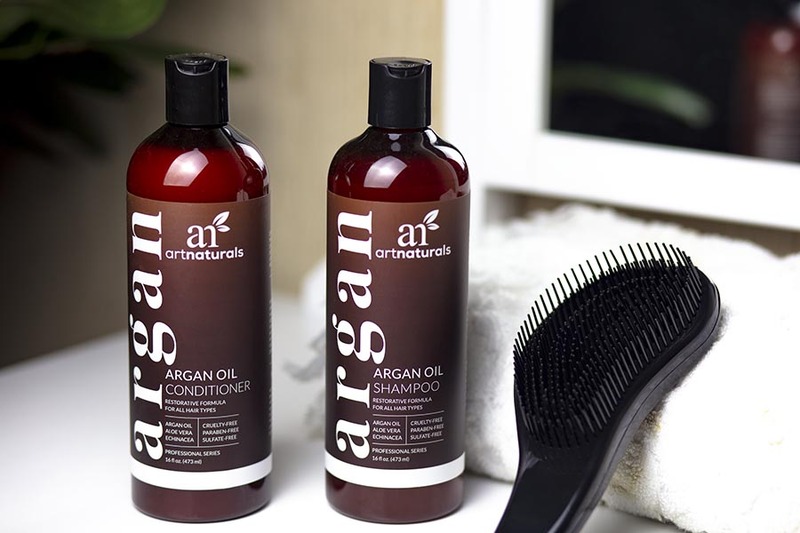 Pure argan oil and pure jojoba oil are also fantastic for just taking care of dry ends. Work a few drops through damp freshly cleansed hair and you’re good to go. You can also make your own hair care serums! We have some super easy DIY jojoba recipes, including a serum that’s awesome for tackling the split ends and frizz that often come along with bleached hair. Protecting your new hair color is easier than you think. There’s no need to resign yourself to brassy yellow blonde while you wait for your next salon appointment. Follow just a few simple hair care rules and it’s possible to keep your hair color fresh and gorgeous in between sessions. Cut out shampoos with sulfates, shampoo only once every 3-4 days, use less heat on your hair, choose hair care meant for your hair shade and keep your hair well-conditioned. You got this! These statements have not been evaluated by the Food and Drug Administration. This information is not intended to diagnose, treat, cure or prevent any disease. The information on this site is meant for educational and informational purposes only, it is not intended or implied to be a substitute for professional medical advice, diagnosis or treatment. Please confirm any information obtained from or through this web site with other sources, and review all information regarding any medical condition or treatment with your physician. Never disregard professional medical advice or delay seeking medical treatment because of something you have read on this website.